To make a donation at any time, please click here. 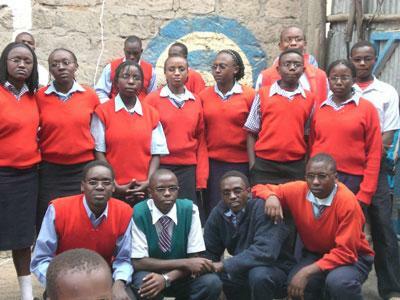 By Grace Disabled and Orphans Centre (By Grace) is located in Kayole, Kenya. Kayole is one of more than 60 designated slums surrounding Kenya's capital city of Nairobi. Kayole is the second largest slum in Kenya; second only to the better known Kibera slum. Both are situated outside Kenya's capital city of Nairobi. Most of the buildings and homes are made from some combination of wood, tin, and cement. 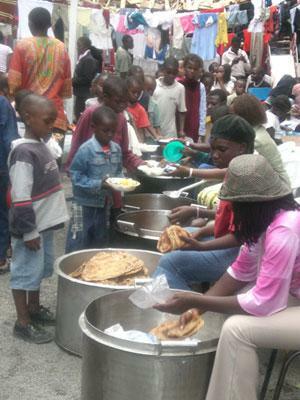 Many in Kayole are homeless and most are hungry. The streets are largely unpaved and cluttered with garbage, sewage, goats, and chickens. Many of the homes do not have running water or electricity. Unemloyment rates are consistently over 50%. Many of the families cannot afford to send their children to school, and still other children are left as orphans due to the AIDS epidemic. There are myriad children living in the streets of Kayole and they are often exploited and abused. It is a place of desperation and suffering; however, you will also find immense hope, courage, and people who will make you stand in awe of their perseverance and dedication to helping others. It is a place where one person can stand up and make a difference in many lives, and does so every day. If you don't believe me, ask the children at By Grace. They will tell you what a difference one person can make. They will tell you how they live because people like you give. But most of all, they will tell you about their mum Salome. Salome, the one person that first stood up for them so that they could have a place to live, food to eat, and a school to attend. In 2001, a Kenyan woman named Salome W. Maturi made a deal with her God... she was experiencing problems with her pregnancy and vowed to spend her life caring for children in need if she could just carry the infant to term. Her request was granted, and ever since, Salome has kept good on her word. She was then living in Kayole, Kenya, one of the numerous slums surrounding the capital city of Nairobi, in a two room flat along with her four daughters and various other relatives. She began taking in orphaned children who were living on the street, begging for food, and sleeping in abandoned buildings or vehicles. Many of these children had lost their families to AIDS/HIV, tribal conflicts, or domestic violence. Soon her two rooms became too crowded, and she decided to rent a building across the street from where she lived to make room for all the children in need. Having no idea how she would manage the costs, she simply plunged ahead, knowing this was what she had to do. She named her new orphanage By Grace, after her little girl, Grace, whom she had such troubles bringing into this world. 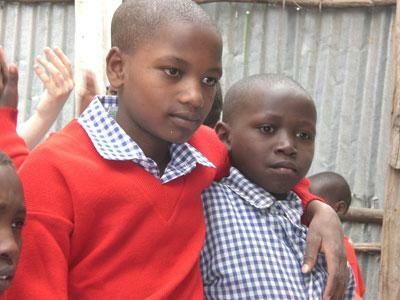 Grace was Salome's miracle, and she wanted her new orphanage to be a miracle for many. She started a free school at By Grace for the orphans and those in the community who could not afford to send their children to school. All teachers were and still remain volunteers. Salome worked with local volunteers to provide shelter, food, water, education, and medical access for the children under her care. Word spread in the community, and before long, government officials were bringing kids to Salome on a regular basis. In 2004 there was a tribal conflict in a surrounding town and one man showed up at the orphanage with 11 children from his village that now were without families to care for them. Not long after, a flood hit Kenya, wiped out villages, and more children came. More parents died of AIDs, and more children came. Sick parents needed to make arrangements for their children before they became unable to take care of them, and more children came. Each and every time, Salome opened the door, and her heart, as she welcomed them into their new family. By 2004 there were over 150 children at By Grace, still living in the two floors of the originally rented building. The roof of the building has been converted into a kitchen, storage area, and one classroom has been built out of tin. There is still no running water, no flush toilets, and there are still no beds. The children carry desks and chairs out of the classrooms and lay down mats to sleep on at night. A volunteer vacation agency began using By Grace as a volunteer site in 2004 which brought volunteers from all over the world. One volunteer helped By grace set up a website and begin it's own volunteer and sponsorship program. Since then, many people from across the globe have donated their time teaching at the school at By Grace and through donor assistance Salome was able to provide these basic necessities to the children under her care. Today, there are over 250 children living and going to school at By Grace...still in the same building, still without running water, flushing toilets, or beds. The children eat only one or two meals a day, depending on available funds, and rarely get meat or fruits. Post-election violence in 2007-2008 destroyed distribution routes, agriculture, and the lives of many many Kenyans. Food and staple supply prices nearly doubled, and have only continued to rise since then. Add to this some of the worst drought conditions in over a decade creating massive water shortages, and currently, the needs of these children are often going unmet. Yet, still, more children come. Salome will continue to stand up for these kids and open the door for them, of that there is no doubt. It is her dream, as well as ours at Stand Up For Grace, that the children at By Grace will eventually be able to move into a place with running water, flushing toilets, and proper beds... that they will have textbooks and learning materials, nutritious meals every day, clean water for drinking, and educational opportunities for their futures. There is so much more that needs to be done. These children have hopes and dreams just like our own. They deserve a chance to stand up and give their gifts to the world. But first, they need you to stand up for them. Anything you can offer. No donation is too small, and 100% of donated funds go directly towards By Grace needs. We welcome words of encouragement as well as fundraising ideas or suggestions on our blog. We are available for presentations to churches, organizations, or any group of people wanting to learn more about the children at By Grace and the work we are doing at Stand Up For Grace. One person really can make a difference. Stand Up with us and see what a difference you can make in the lives of these children today.